Designing a tile backsplash can be a fun, fulfilling project – as long as you follow the right steps to find the perfect materials and design. Below, we offer countertop design gurus’ suggestions for how to plan a tile backsplash. Mediterranean. If your home has a Mediterranean style, or if you’d like to reinvent your kitchen in this timeless mode, tile countertops are definitely the way to go. Mosaic tiles are central in Mediterranean interior design, which also includes rustic wood and leather furniture and iron accessories. United Tile’s travertine and stone mosaics collections are a good place to start when browsing for Mediterranean tiles. Most stone tiles will compliment this style well. Modern. The modern design palette includes neutral colors with pops of accent colors. Stainless steel tile countertops and backsplashes perfectly accent a modern décor. Everyone Stainless Steel tiles from Pental are a wonderful choice, both for design and sanitation purposes. Monochromatic ceramic tiles also work well with modern designs. French country. This style features cheerful floral and pastoral designs in blue and yellow or red and yellow. To add a more international flare to your French country backsplash, check out United Tile’s Walker Zanger “Contessa” collection, a grouping of hand-painted ceramic tiles inspired by Italian, French, Moroccan and even Chinese styles. Asian, Arts and Crafts, Mid Century Modern and Coastal are other popular design modes. Some houses feature different styles in each room. If this is the case for your home, match your countertop design to the décor in your kitchen. Go ceramic. Ceramic tiles are enjoying a renaissance, thanks to their durability and beauty. 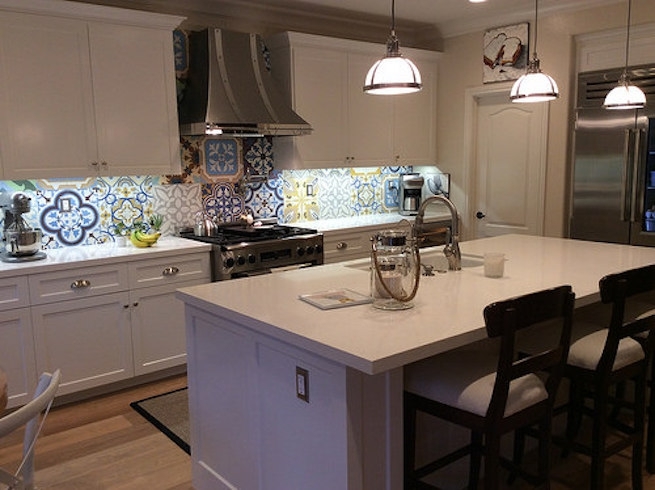 Some homeowners are even using clean white ceramic subway tiles for their backsplashes. If you’re looking for an easy-to-clean material that will last for years, ceramic is the perfect choice. A splash of color. Countertop design experts agree that the backsplash is one area where you can afford to add some color, assuming it complements the rest of your décor. Mix it up. Don’t feel limited to one type of material when designing your tile countertop and backsplashes. Some of the most delightful contemporary designs mix marble, stone and even stainless steel tiles in the same backsplash. A touch of bronze. Unless you’re emphasizing a monochromatic color scheme, plain tiles can be a bit boring. To spice up any countertop design, consider adding a couple of bronze accents. You might be surprised how easy it Is to find bronze tile. Countertop designers recommend bronze plumbing fixtures, as well, to create a sense of consistency with your bronze-kissed backsplash. Bring in the light. If your kitchen feels dark, opt for reflective glass or stainless steel tiles for your countertop design. While flipping through tile catalogues, remember to think about texture and shape as well as color. The backsplash is often the focal point for the entire kitchen. Using curved tiles, or textured tile accents, can draw the eye right to the backsplash and thereby enliven your tile countertops. Once you have a basic understanding of your home’s design and popular tile countertop trends, it’s time to measure the space your backsplash will occupy. Measure vertical, horizontal and diagonal elements. Create a sketch of your space, and include features such as electrical plugs. Create a to-scale sketch of your space using graph paper, and make a dozen copies of this design template. Then get creative! Color in your templates with different styles that appeal to you and match your décor. If this seems like too much work, it may be best to contract a designer for your backsplash and countertop design.